There was nothing in the upbringing of Burt Williams that would suggest he would become one of California’s most revered winemakers. Born in San Francisco in 1940, Williams grew up in the city, but spent his summers in the Russian River Valley with cousins, aunts and other members of the extended family at his family’s summer house. At the age of 13, his father passed away, and his mother, who wanted to escape the city, moved the family permanently to their Russian River Valley home. After graduating from high school in Sebastopol, Williams did not have enough money for a college education. An uncle was a printer and the profession paid well at the time, so one week after leaving high school, Williams began a six-year printer apprenticeship in San Francisco at the San Francisco Newspaper Agency, publisher of the San Francisco Examiner and Chronicle. In 1962, Williams bought a house in the Hacienda Bridge section of rural Forestville and returned from San Francisco to live there the following year. Williams still owns the house to this day. It’s location, “Hacienda Del Rio,” would grace the label of the first wines Williams crafted with friend and partner Ed Selyem. During the summers spent in the Russian River Valley, Williams hung out with locals Brad and Ronnie Nichol, whose younger sister, Gayle, married Ed Selyem. Because of that connection, Ed, who is five years younger, became friends with Burt. The two were neighbors, living just across the Russian River from each other. Ed was a home beer and fruit wine maker, but had a taste for vinifera libations as well. Williams was enamored with wine by his late teens. He bought his first case of wine, a Zinfandel from Pedroncelli, at the age of 20, and made his first wine in 1964 at the age of 24 at his house in Forestville. During the early 1960s, growers had difficulty selling their grapes. Williams had some friends whose neighbor had a well-established Zinfandel vineyard, and since the owner could not find a buyer for his grapes, he gave some to Williams. Williams had tasted an occasional good Pinot Noir from California, but there were few “repeaters,” he noted. Consistently fine California Pinot Noir was nowhere to be found. Blessed with a superb palate and possessing a self-taught keen understanding of how Pinot Noir should be crafted, Williams decided he wanted to make unusually good, world-class Pinot Noir, do it consistently, and develop a “niche” for something that no one had ever done before in California. Williams began to read every book on wine and winemaking he could get his hands on. There were plenty of winemakers in the Russian River Valley he could talk to as well, and he visited many of them. The experienced Italian winemakers in the area were especially helpful, offering practical advice and encouragement. Williams attend many Burgundy tastings in San Francisco and bought as many Burgundies as he could afford. A few courses from University of California at Davis added to his knowledge. He never set foot in Burgundy because of his admitted reluctance to fly. Williams and Selyem began their weekend home winemaking operation with the 1979 vintage, crafting the wine next to Williams’ Hacienda Del Rio house, and storing the barrels in the basement. They began with a shoestring, each contributing $5,000. They were not bonded initially, and the 1979 and 1980 wines were not commercially legal. The wines were bottled under the Hacienda Del Rio label, a reference to Burt’s house on the Russian River. The sketch on the original Hacienda Del Rio Winery label was taken from one by the second illustrator (Hablot Knight Brown) commissioned for Charles Dickens’ first novel, “The Pickwick Papers.” It is titled, “Mr. Weller and his friends drinking to Mr. Pell.” A later version of the Hacienda Del Rio label looked similar to the current Williams Selyem label, using the same letterpress letters, color and paper. Williams later designed the classic Williams Selyem label which appeared in 1984. This design was carried out by a graphic artist, displaying a simple red and black color scheme and adorned with a single dingbat. The photos of historic bottles below are courtesy of Ben Papapietro. The upper photo shows original bottles including a 1980 Hacienda Del Rio Pinot Noir. The lower photo shows the entire range of labels from the first vintage, a 1979 Zinfandel on the far left, to the current label on the 1995 Pinot Noir magnum on the far right. Ben Papapietro also worked at the San Francisco Newspaper Agency and struck up a friendship with Williams. He first helped Williams fashion his homemade wine in 1980 and continued to work harvests at William Selyem winery after it was launched. Today, he is the winemaker for his own winery in Healdsburg, Papapietro Perry. A few bottles of the early production were sold and got out to wineries, and when a government agent spied some bottles on a winery visit, he phoned them, advising them to become bonded, which they did in 1981. Williams was 41 years old and Selyem was 36. 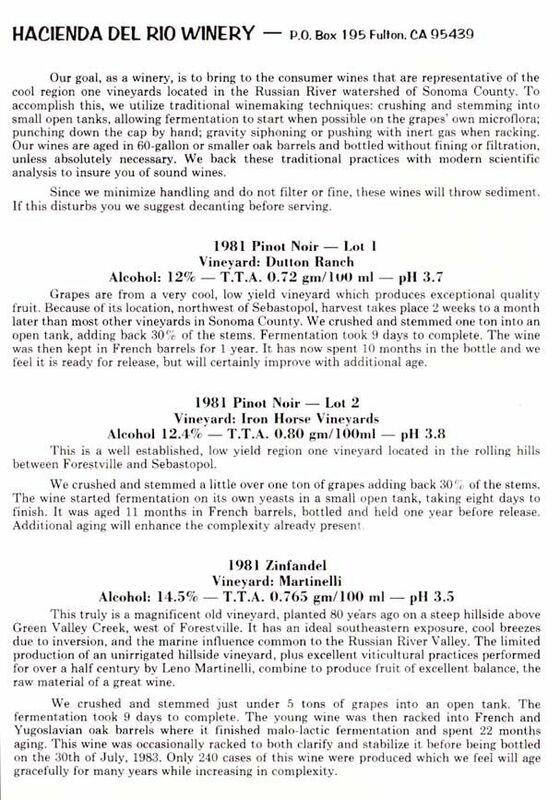 They began with a total commercial production of 343 cases in 1981 (see offering below), then 475 cases the following year, 600 cases the next year, and gradually ramped up the output. From 1981 to 1983, the Hacienda Del Rio wines were crafted at Russian River Vineyards in Forestville. 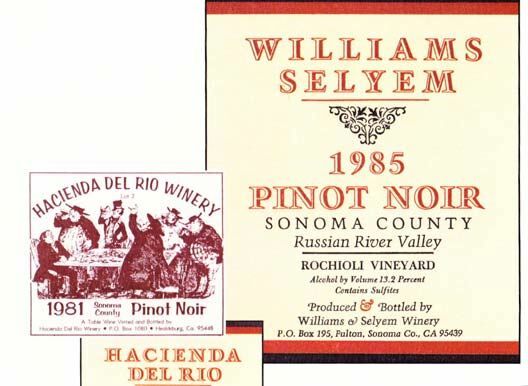 Williams, whose first Pinot Noir was bottled under the Hacienda Del Rio label in 1980, was not the first to vinify Pinot Noir in the Russian River Valley, but he was to achieve the most early notoriety. The first plantings of Pinot Noir, or something very close to Pinot Noir, was reportedly farmed by the Fountaingrove Winery north of Santa Rosa in the 1930s. The modern era of Pinot Noir viticulture in the Russian River Valley began when the Bacigalupi family planted Pinot Noir on Westside Road in 1964. Rochioli Vineyard followed in 1968 and Joseph Swan’s Trenton Estate Vineyard in 1969. By 1973, Davis Bynum had released the first vineyard-designate wine from the Russian River Valley, a Rochioli Vineyard Pinot Noir, crafted by Gary Farrell. 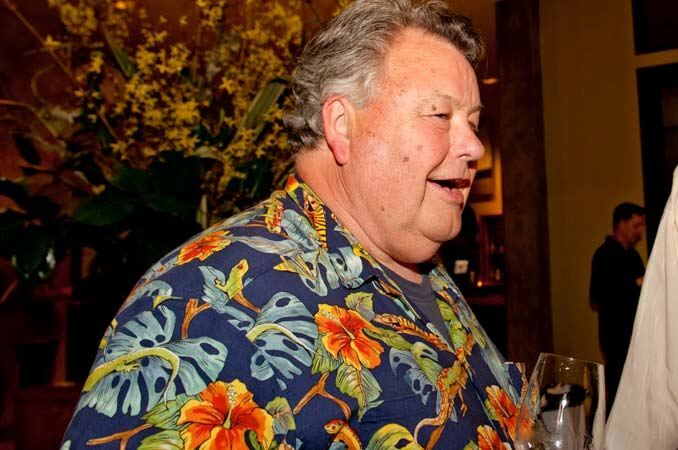 Tom Dehlinger released his first Russian River Valley Pinot Noir in 1977. 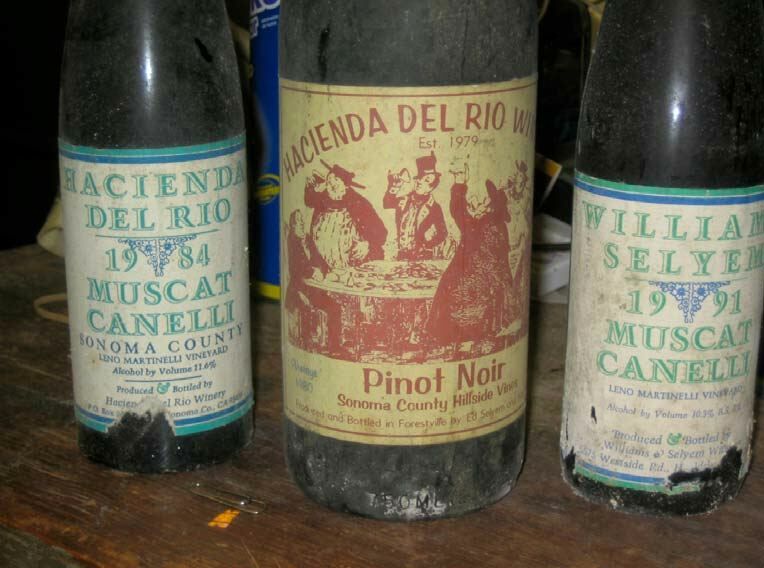 A complaint from Hacienda Wine Cellars prompted the partners to drop the original Hacienda Del Rio winery name and substitute Williams Selyem beginning with the 1984 vintage. A copy of The Wine Spectator report on the change in name of the winery is below. 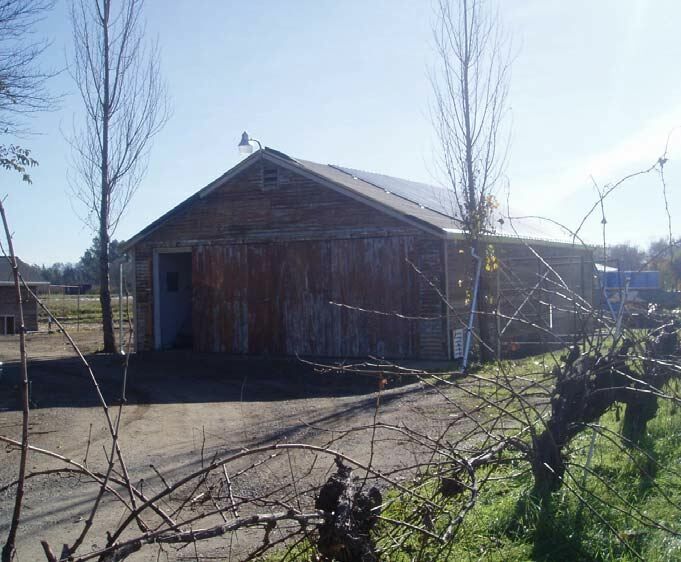 Also in 1984, production was moved to a leased 900 square-foot, two-car garage adapted for winemaking on River Road in the small Russian River Valley town of Fulton. Williams Selyem became the first of many California “garagiste” Pinot Noir producers. What distinguished Williams Selyem was that their winery really was in a garage, while others to follow often worked out of larger warehouse type facilities. The photo below shows the original garage as it looked in 2009. Fermentations were carried out on a pad next to the garage. By 1984, Williams Selyem had begun to focus primarily on Pinot Noir, supplementing that production with a few hundred cases of Zinfandel and a tiny amount of Muscat Canelli, the latter two from Leno Martinelli’s Jackass Hill property. Chardonnay came in 1990. In 1987, Joe Rochioli introduced Burt and Ed to Howard Allen, a bighearted sort, who offered to construct a winery building on his Allen Ranch property on Westside Road that Williams Selyem could lease. The move to the 3,200 square-foot warehouse styled facility was consummated in time for the 1989 harvest (see photo of the winery below). At the time of the move, annual production was 2,100 cases (300 cases of Zinfandel and 1,800 cases of Pinot Noir including Sonoma County, Sonoma Coast, Allen Vineyard and Rochioli Vineyard bottlings). By 1993, a 3,000 square foot building was added on the Allen Ranch for bottle aging and storage. The pair offered quite a contrast. Burt was burly, unassuming, had a hearty laugh, and preferred colorful short sleeve sport shirts with suspenders. His wife, Jan, made the shirts for him. Ed was a handsome sort, more outgoing, with a sly sense of humor, and often outfitted in tee shirts, shorts and boots. They held back a significant amount of their production for their own enjoyment, and truly enjoyed their craft. For the most part, they shunned publicity, declining to put up a Williams Selyem sign at their modest wineries and never had a tasting room, preferring to offer tasting by appointment once they were established. For many years, Williams and Selyem continued their day jobs (Burt as a pressman for the San Francisco News Agency and Ed as a wine buyer and accountant for a Speer’s Market in Forestville) as they raised their families, taking vacations at crush time to make the wines. They had an ideal business relationship: Williams directed the winemaking and Selyem managed the money and the sales and distribution of the wine. Williams noted, “We never took any money out (initially), grew 25% per year, and kept putting any profits back into the business.” Spouses Gayle Selyem and Jan Williams were also partners in the winery which early on hired no outside help. It wasn’t until late 1989, after moving into their winemaking facility on Allen’s property that the partners quit their day jobs and worked full-time at the winery. The pair began buying grapes from Joe Rochioli in 1979 before they were bonded. Williams recalls that Joe sold them their first Pinot Noir from the coveted West Block of his vineyard for $550 to $600 a ton. Growers like Joe had it tough at the time. Joe was selling most of his Pinot Noir to Korbell for their sparkling wine. Premium Pinot Noir was picked at 18º brix and sold for about $500 a ton. From 1979 until Williams Selyem was sold in 1997, Williams Selyem and Gary Farrell were the only producers that received West Block fruit (The Williams Selyem bottling from West Block was labeled as “Rochioli Vineyard”). Joe’s son, Tom, who would take over the winemaking at Rochioli Vineyards & Winery in the early 1980s (Gary Farrell crafted the first Rochioli brand Pinot Noir in 1982), kept a good part of the fruit for Rochioli’s own West Block bottling. It would have been easy, and certainly more financially rewarding, for the Rochiolis to keep all the West Block fruit for themselves, but their generosity and friendship would prove critical for the future success of Williams Selyem. Joe Rochioli and Rochioli Vineyard West Block pictured below a few years ago. Since Williams had spent at least a significant part of his life in the Russian River Valley, he knew where the vineyards were located. Fortunately, in the late 1970s and early 1980s, there was plenty of good grapes and they were cheap. 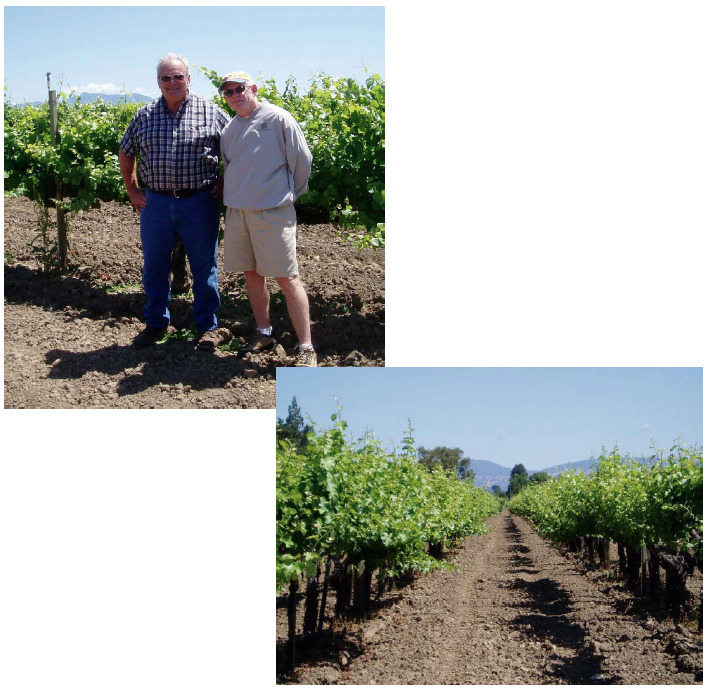 In 1980 and 1981, Burt and Ed sourced grapes from Iron Horse and from 1982 to 1986 from the Dutton’s Arrendell Vineyard. Grape sources would come and go, such as the Buena Tierra Vineyard (planted in 1978 and one of the oldest Pinot Noir vineyards in the Russian River Valley) and Cohn Vineyard (first used as a vineyard source in 1993), and others never proved acceptable to Williams (for example, Thieriot Vineyard). 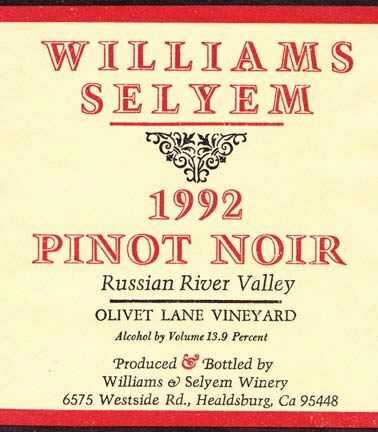 In 1988, fruit from the Summa Vineyard was offered to Williams Selyem. The vineyard was located in the far reaches of West Sonoma County in the region now known as the true Sonoma Coast and was Williams Selyem’s first venture into this very cool growing region. Wine had been made from the vineyard and Williams liked it. The only problem was, the Zellers, who owned the vineyard, wanted $1,000 per ton for the grapes. Williams Selyem was only paying Rochioli $800 to $850 per ton at the time. Williams had to tell Joe Rochioli that he would have to charge them $1,000 per ton, as they just wouldn’t feel right paying more for grapes from Summa Vineyard. Summa Vineyard was situated in a very marginal location that was buffeted by wind and consumed by fog, often suffering poor fruit set, but produced very dense, complex wines. Williams had to enlist the services of a vineyard consultant to direct the farming at Summa Vineyard in the early 1990s. Also in 1987, Joe Rochioli introduced Burt and Ed to Howard Allen who owned a vineyard farmed by Rochioli directly across Westside Road from Rochioli’s vineyard. Allen Vineyard became a single-vineyard bottling in the Williams Selyem lineup beginning the same year. The partners also developed a long-term relationship with the Pellegrini family who owned the Olivet Lane Vineyard on West Olivet Road in the Russian River Valley, and released their first Olivet Lane Vineyard Pinot Noir in 1987. A photo of the Olivet Lane Vineyard in recent years is shown below. For Bob Pellegrini, it was the first time their fruit had been handled in an artisan fashion, and their cordial relationship would last 11 years. Hirsch Vineyard (1994), Coastlands Vineyard (1994), and Precious Mountain Vineyard (1996), all in the far western reaches of the Sonoma Coast, and Ferrington Vineyard (1993) in the Anderson Valley were added in later years. Williams wanted the best fruit he could get his hands on and he would pay top dollar for it. He would pay a premium for low yields, sometimes 50 percent to 150 percent more than the going prices for Pinot Noir. All contracts except Olivet Lane were verbal, sealed with a handshake. The Pellegrini family wanted some type of formal agreement so a simple one-page contract was drawn up and signed. Grapes were always paid for by the ton or the row and not by the acre. Many growers were struggling, so Williams Selyem would occasionally pay for grapes before harvest and lend money to growers when they need it. It was clear to Williams that his grape sources were critical for his success. Leno Martinelli, a legendary winegrower in the Russian River Valley, was an early source of Zinfandel for the fledgling Hacienda del Rio Winery. Giuseppe and Luisa Martinelli planted their Jackass Hill Vineyard in 1899. Leno Martinelli was given the Jackass Hill Vineyard at the age of 16 and was to farm the vineyard every year thereafter, making wine each year from the vineyard as well. The Williams Selyem Leno Martinelli Zinfandel was to become a staple in the Williams Selyem lineup. Williams recalls stopping by Martinelli’s house and Leno would go to the basement, pull out an old bottle, say one from 1947, and they would all drink it together. The wines were always marvelous, according to Williams, and drank more like a first growth Bordeaux than a Zinfandel. He remarked, “No bottling of any grape varietal on this planet has more power combined with such velvety texture.” Williams Selyem produced a Zinfandel from fruit grown at Jackass Hill Vineyard from 1979 until 1992. Early on the wine was label “Hillside Vines,” and later Leno Martinelli Vineyard. 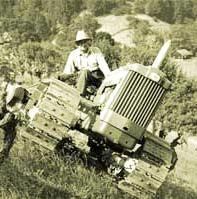 Photo below shows Leno Martinelli on his tractor at Jackass Hill Vineyard in 1950. Williams recalls that he and Ed visited their vineyards during the summer and two to three times a week near harvest when they took 5 gallon buckets of grapes back to the winery as samples. Grapes were not picked solely on sugar levels, instead focusing on acidity which was considered key for aging. Hydrometers were used to run titratable acidity and pH levels. Williams said, “The goal was to pick at a time when they could get the most out of the vineyard without additions.” He emphasized the importance of spending time in the vineyards and “paying attention,” something that winemakers of the 1980s were not want to do. As an example, he remembers 1989 at Olivet Lane Vineyard. Normally picking would begin at 23.5º to 24.0º Brix, but in this vintage the grapes only reached 22.5º Brix and the acidities were dropping. A decision was made to pick. It rained the next day (Williams admits he did not predict the rain), preventing pickers from getting into the vineyard for a couple of weeks, and Williams Selyem was the only winery to make Olivet Lane Pinot Noir that year. Preserving vineyard character was top priority and that is how the idea of vineyard designated wines evolved. Williams Selyem was not the first winery in California to vineyard designate Pinot Noir (Acacia Winery has that honor), but Williams Selyem made household names of vineyards like Rochioli, Allen, Olivet Lane and Summa. However, not every vineyard met Williams’ high standards and only the best were deemed able to stand on their own as a vineyard designate. Grapes from growers that did not fit into the Williams Selyem vineyard designate program were blended and bottled as Sonoma County, Sonoma Coast and Russian River Valley. With carefully chosen grape choices, Williams’ winemaking acumen, and the partner’s commitment to quality, Williams Selyem was poised for success. Ironically, it was the partner’s limited capital that led to their good fortune. Burt and Ed were forced to perform all the work in the winery themselves. As it turned out, and North American winemakers eventually came to realize this, Pinot Noir was the one grape that demanded careful handling, constant attention and benefited the most from a hands-on approach. As Williams has noted, “We employed old, traditional methods of winemaking, which turned out to be the best ways. We kept it basic and simple: no pumps, no filtering and did nothing that we didn’t have to.” They followed the advice of local veteran Italian winemakers who told them to improvise rather than buying any new equipment. Their first sorting tray was built from a sheet of plywood covered with plastic, and this allowed them to make a vigorous selection of grapes that went into the wines. Initially they borrowed a used de-stemmer from Lytton Springs Winery, eventually buying it in 1984. Their hand-crank press dated to 1915 and was borrowed initially from a family friend. When they first obtained the press on loan, it hadn’t been used in forty years, but were able to restore it to working order and used until 1989 when they were able to buy a new basket press. Initially they used small 40-pound lug boxes to hold the grapes at harvest. The boxes were loaded onto a 350,000-mile Chevrolet pickup parked at the end of the rows, weighed, and taken to the winery. By 1987, there were far too many lug boxes. Quarter-ton wooden bins were then used but they needed a bin dumpster above ground to send the grapes onto the sorting table, and in turn, the de-stemmer. Williams’ son-in-law designed and built a unit to accomplish this transfer of grapes. (The photo above of Burt & Ed shows this unit in the background). By 1991, they had acquired a new de-stemmer which further improved the quality of the wines. Halved double-wall stainless steel dairy tanks were used for fermentations. The partners had seen them in use at other wineries such as Edmeades and Hop Kiln. In the early 1980s, the tanks were no longer in use for storing milk and they were inexpensive to buy, selling for fifty cents to a dollar and a quarter per gallon. They were constructed of better quality stainless steel than containers currently in use in the wine industry. The main advantage of the tanks was the better cap to juice ratio, that is, more cap surface area compared to the traditional six foot high fermenters in use at the time. Extraction was improved, and punch downs four to six times a day could more easily and effectively be employed. On newly acquired tanks, Williams’ son-in-law would cut out the extraneous metal, re-plumb them and install the cooling systems required to control fermentation temperatures. These tanks are still in use at Williams Selyem and other wineries today. The tanks were placed on a cement pad adjacent the garage in Fulton. Cargo shipping containers were rigged to store barrels. The containers once held New Zealand lamb carcasses. The partners delivered about 15% of their production to select retailers with good palates and restaurants because they enjoyed meeting people in the wine business and relished the personal contact. This was how, for example, they met Manfred Krankl, who was working at Campanile restaurant in Los Angeles. Recently, Krankl remarked, “I’ve always adored the guy (Williams) and he has been a big influence on my winemaking philosophy: something he probably doesn’t even know about. I would put him in the top three folks that have shaped my thinking concerning wine.” Retailers and restaurateurs were charged full retail price for the wines and wines were only sold to those who paid up. 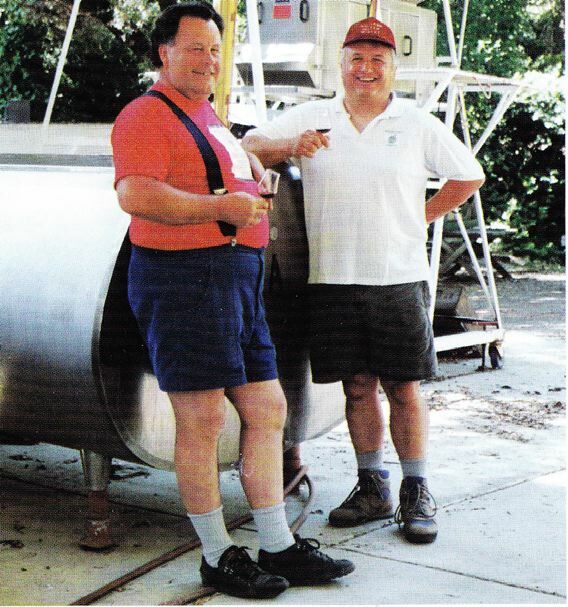 Burt and Ed attended as many local wine tastings as possible early on to obtain exposure for their wines, and entered a number of wine competitions. The turning point in the notoriety of Williams Selyem came in 1987. 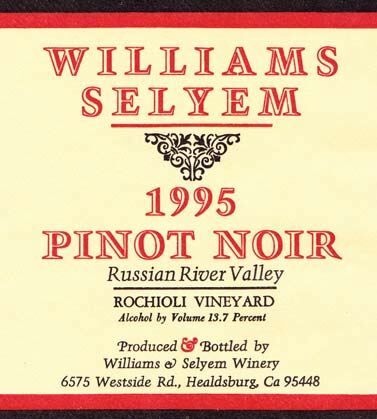 The 1985 Williams Selyem Rochioli Vineyard Russian River Valley Pinot Noir won the Sweepstakes at the California State Fair Wine Competition and became the most seminal wine in the history of California Pinot Noir. The wine was voted the best of the 2,316 wines entered by 416 wineries in 1987. 295 cases of this wine were produced and it was sold for $16 a bottle. 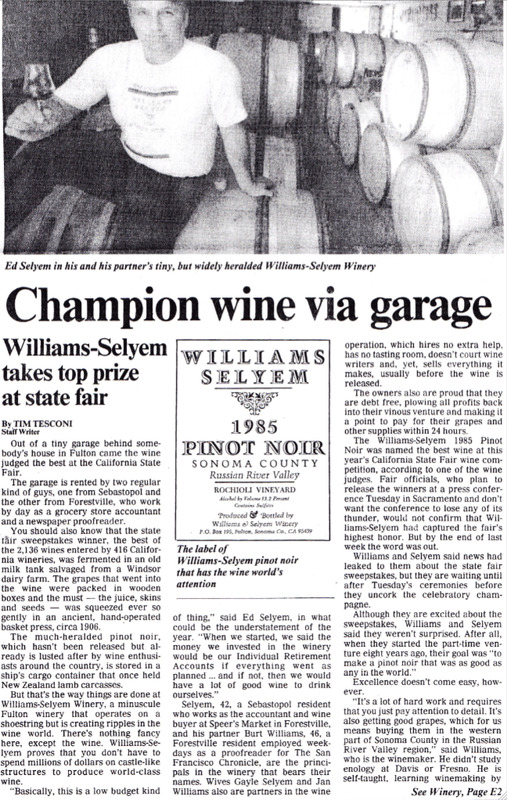 An article appeared in the June 27, 1987, business section of The Press Democrat (Santa Rosa) announcing the top prize won by Williams Selyem. Note the incorrect name of the winery in the article copied below. The early winery mailers written by Ed and sent to consumers referred to the name of the winery as Williams & Selyem Winery, to be later shortened to Williams Selyem, but the two names were never hyphenated. From 1980 to 1984, Rochioli Vineyard fruit was blended with other vineyard sources, but in 1984, Williams felt the Rochioli Vineyard Pinot Noir was complete enough for a vineyard designated bottling on its own, although it was deemed too fruity. To counter the fruitiness, Williams increased the percentage of new oak, aging the 1985 Rochioli Vineyard Pinot Noir in 100% new oak for 17 months. This was the first Williams Selyem Rochioli Vineyard designated Pinot Noir. Williams’ uncanny intuition was correct and he would remark, “It put us on the map.” The 1986 Rochioli Vineyard Pinot Noir was priced at $25 a bottle, a significant increase that buyers did not blink at. Favorable press soon followed and demand snowballed. Williams Selyem was showered with accolades. Wine writer Dan Berger said, “Best Pinot Noir in America and a rival to the best in the world.” Respected wine writer, Matt Kramer, declared, “Williams Selyem is the best Pinot Noir in California. Pinot Noir of delicacy, finesse and profound flavor.” Anthony Dias Blue, a leading worldwide food, wine and lifestyle authority, chimed in, “Williams Selyem Pinot Noir shines above the rest.” James Laube said, “Winemaker Williams had a tremendously intuitive sense of how Pinot Noir should be vinified and how it should taste.” Williams Selyem Pinot Noir was served to several Presidents and dignitaries at State dinners through the years which added to its notoriety. At the Wine Spectator Experience in New York in 1986, Williams was named one of America’s top new winemakers along with George Bursick, Tony Soter, Randall Grahm and Randy Dunn. 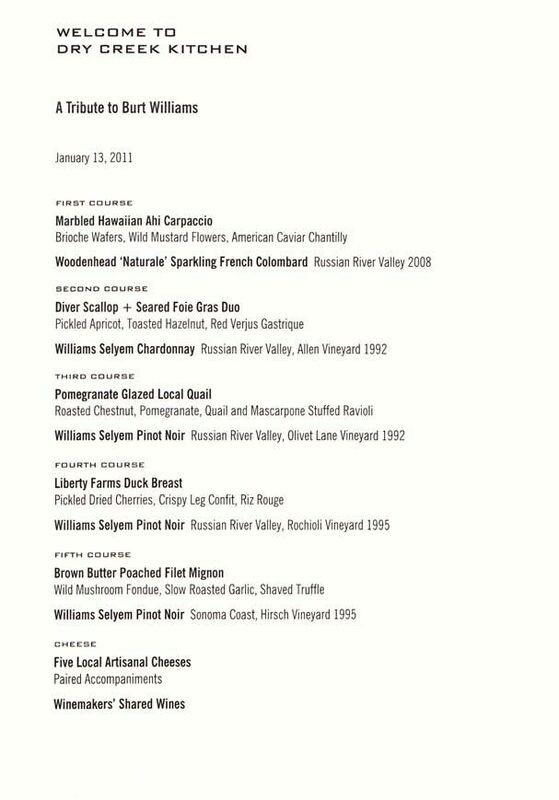 At this event, Williams mixed with distributors and soon Williams Selyem appeared on the wine lists of notable restaurants such as Charlie Palmer’s Aureole in New York. After winning the Sweepstakes Award, Williams decided to get his wines into the best restaurants and resorts in Monterey and Carmel, knowing that affluent people visited the resort area from all over the United States. Diners were soon calling Williams Selyem from everywhere in the United States, asking for wine. Americans had never tasted any Pinot Noir like Williams Selyem and they clamored to acquire their share. When the Sweepstakes Award was announced, the mailing list was flooded with requests from eager buyers. The mailing list became so popular a waiting list was eventually developed for those begging to get on the mailing list. Eventually, more than 85% of the people on the list bought wine when it was offered. Ed managed the list masterfully, and enjoyed being in contact with, visiting with, and learning from devoted customers. Eventually, the list required two full-time employees to oversee it and its delicate management became a headache. As production escalated and the winery work proved more demanding, a number of people offered their help at harvest. Bob Mosby, who is now the General Manager at Benovia Winery in Santa Rosa, was one of the first, dating back to 1989, to volunteer his time at harvest. Nikolai Stez, who grew up in the Russian River Valley, became a regular at harvest and eventually spent 17 years as an assistant winemaker for Williams at Williams Selyem. Inspired by Williams, he now is the proprietor and winemaker for Woodenhead Vintners in Santa Rosa. 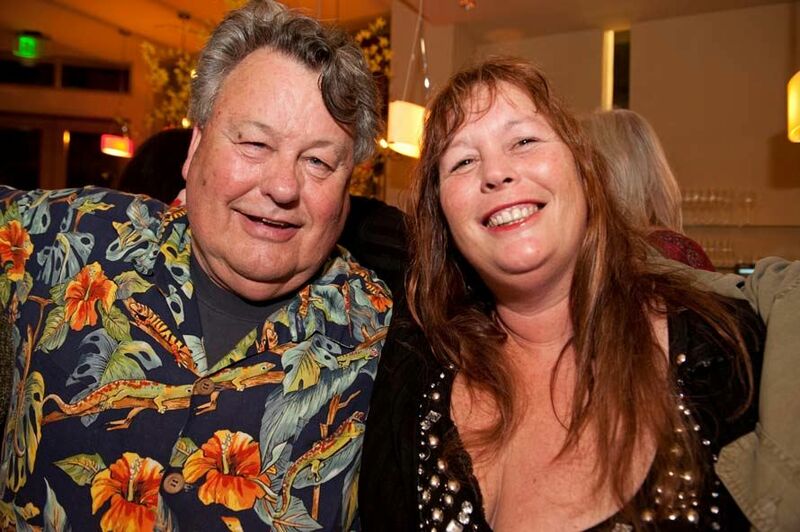 Nikolai is pictured below with his partner, Zina Bower, at the 2010 Pigs and Pinot event in Healdsburg. What was it that made Williams Selyem Pinot Noir so special? As a relative early mailing list member and devotee I can tell you my impressions. The wines were simply magical and a 1992 Rochioli Vineyard Pinot Noir made such a powerful impression on me that even today I can taste the wine, and clearly believe it was the greatest California Pinot Noir I have ever had. Today, after ten years of writing only about Pinot Noir, I can trace my long and winding Pinot trail back to that epiphanic bottle of Williams Selyem Rochioli Pinot Noir. The Williams Selyem Pinot Noirs had a powerful charisma that turned on many devoted followers. Their reverence was humorously depicted in a piece written by one of the winery’s devotees that was included in one of the Williams Selyem newsletters. It read, “We are a little concerned about my brother-in-law, who had never tried world class wine until we shared a bottle of your 1991 Olivet Lane Pinot Noir with him. Now he’s lost interest in work and has moved the La-Z-Boy downstairs into the wine cellar. He claims he just wants to watch, but it’s hard to say what needs matching down there. We’re hopeful that he is just displaying an initial zeal of a new convert, and that he will return to a more normal life when he gets accustomed to venerating your wine.” Another customer wrote the winery asking them to hurry with their next release because they had missed the last one and their friends had stopped coming over. Williams did not unnecessarily concern himself with the public’s attraction to his wines, and at least initially, was surprised at their fame. When asked by wine writer, Donald Breed, in 1994, “Why is your wine so good,” Williams answered, “You got me.” He was encouraged that consumers enjoyed his wines, but he was more concerned with making wines that pleased himself. The wines were usually moderately light in color, very fruity, charming and complex when young, with vibrant aromatics that changed dramatically over time in the glass. Although delicious upon release, the wines would age better than many California Pinot Noirs of the time. People were want to say, “These wines are so good when young, they can’t possibly age.” Their age ability was in part due to their moderate alcohols and well-honed acidity, as well as their impeccable balance. Balance was important to Williams as he has explained, “Wine needs to be transparent and to be transparent, it must be balanced. Over ripe, over blown wines do not reflect the site.” Williams also intended the wines to be food-friendly. He said, “I wanted the wines to be an everyday beverage, not put on a pedestal.” A number of chefs were inspired by Williams and his wines. The wines had perfectly ripe, sweet-like fruit flavors and supple textures, and the generous use of new oak contributed a signature vanillin flavor. The terroir of the vineyards was apparent when tasting them next to each other. The Williams Selyem wines peaked around 6 or 7 years after release, but well-cellared versions and magnums lasted well beyond this. The quirky garagiste origins of the wines added to their mystique with their scarcity contributing to the appeal, but the fact was, these were flat-out some of the greatest California Pinot Noirs of their time. The winemaking regimen would be considered routine today, but was innovative for California twenty-five years ago. We might categorize it as natural winemaking. The Williams Selyem Pinot Noirs were largely made from de-stemmed clusters. Only if the stems were ripe, and then only stems from chosen vintages would be included in a modest percentage. Stems were not used in wines that tended to be tannic. Williams believed that his customers did not relish tannic wines and so whole cluster inclusion was never allowed to impart noticeable tannin to the wines. For example, the Mt Eden clones obtained from Hirsch Vineyard were very tannic and the stems were never used. 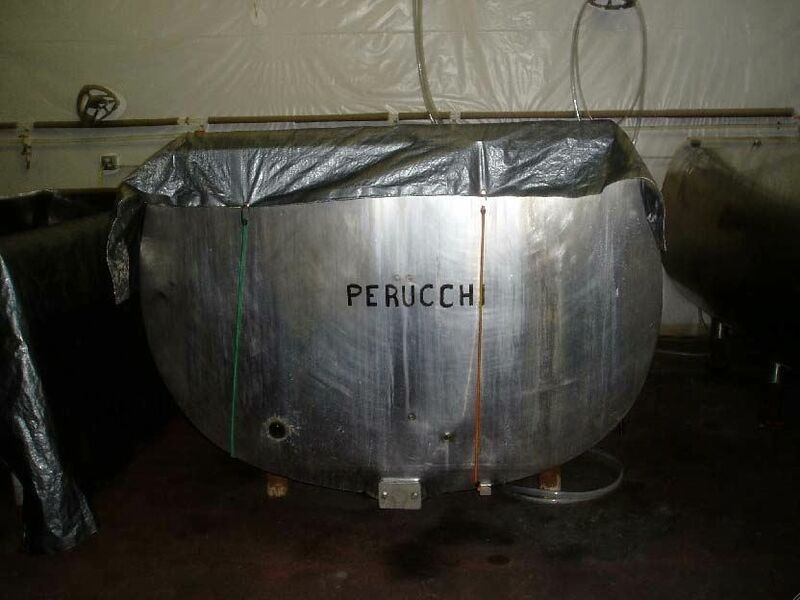 As to Rochioli Vineyard, up to 33%, and even 50% whole cluster were included in the ferments. Fermentations were always native, but changed dramatically in 1984. A government rebate was offered this year on laboratory work to benefit the wine industry. Williams always wanted to isolate his own yeast that would allow him to avoid filtration so he took advantage of this rebate. He developed a version of an indigenous strain from Leno Martinelli’s Jackass Hill Vineyard, isolated by Vinquiry, a commercial laboratory in Healdsburg. The old vineyard provided a perfect setting for wild yeast isolation. Pumice had been added back to the vineyard yearly. The Saccharomyces yeast was strong, able to take grapes with high brix to dryness. From 1984 forward, pre-fermentation maceration lasted 3 to 4 days, followed by inoculation with the Williams Selyem proprietary yeast. Williams would remark, “The yeast always worked and there were no problems in the bottle later on.” Today, the yeast is available to winemakers as the Williams Selyem strain. Williams used his intuition to guide his fermentations which were dependent on the vineyard source and vintage. If the fruit was pristine, he would do extended maceration. The first few days there was little juice, so he would put waders on and tread on the grapes to get some juice freed up, then continue with punch downs later on. There was no grape crushing per se. The best wines were produced with fermentations started cool and slow, temperature rising in the middle and peaking at 88º to 90º at the end for 1 to 2 days. Temperatures were checked frequently and good control was obtained with the cooling jackets of the milk tanks. The free-run juice was siphoned to barrel by gravity while still warm and the remaining must and juice in the tanks was removed with buckets for light pressing. Malolactic fermentation progressed in barrel after being induced, finishing usually by the following January or February. The wines would be racked off their lees and different blocks blended, with the wines barreled separately by gravity in March. The wines were usually unfined and never filtered. They were hand bottled, labeled and foiled. Williams chose his barrels after reading French texts. He discovered a 3-year study in Burgundy that determined the best oak barrels for Pinot Noir were from Troncais oak from the Allier forest. He chose Francois Frères as his preferred cooper, figuring, “If they were good enough for DRC, they were good enough for Williams Selyem.” The amount of tight-grain French new oak used varied depending on the vineyard source. He found, for example, the wines from Rochioli Vineyard were deemed too fruity initially and when he increased the new oak to 100% beginning in 1985, the wine was more desirable. He remarked, “I didn’t want fruit bombs. I was more concerned that the wines tasted like wine.” Elevage in oak varied from 11 months for the Sonoma County Pinot Noir bottling to 17 months for the Rochioli Vineyard bottling. The barrels were never used more than twice. Williams felt comfortable only delegating a few basic chores in the winery and he was working up to 16 hours a day during and after harvest as a result. The winery, which began as a fun job, had escalated in complexity and intensity. Writers and critics were constantly grading and judging the wines, creating more pressure and causing the partners to drift away from their original intentions. Ed Selyem’s back began to bother him, limiting his participation in some winemaking activities. He offered to sell the winery to Burt, but Burt was unhappy working long hours and making more wine than he wanted. The popularity of Williams Selyem wines had taken its toil over the years and the winery was finally put on the market in 1997. After entertaining a number of suitors, including football player and wine aficionado Joe Montana, Williams Selyem was sold March 1, 1998, to New York-based vintner John Dyson, a long time member of the Williams Selyem mailing list, for a reported $9.5 million. Dyson essentially bought the name and inventory of Williams Selyem, since Burt and Ed owned no vineyards or a physical winery. The last vintage that Williams vinified at Williams Selyem was 1997. 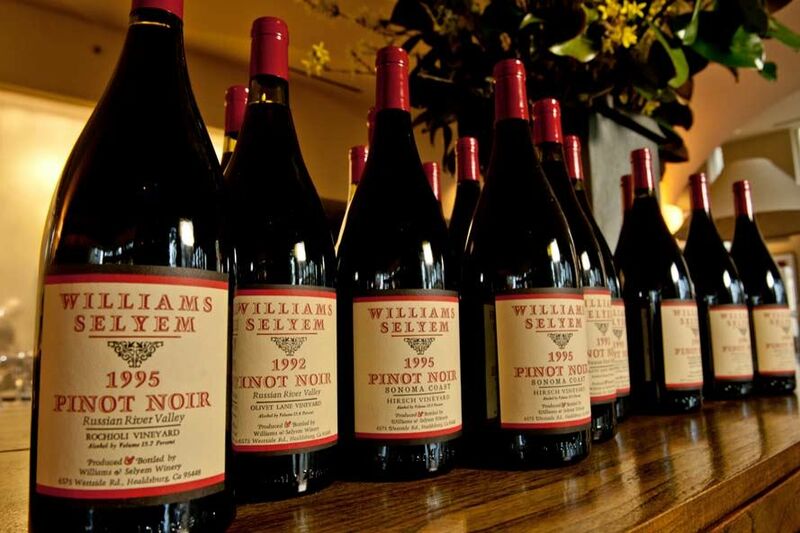 Williams was asked to consult at Williams Selyem for a few years after the sale, but he could never put his heart in it, and after the 1998 vintage, left permanently. At the time the winery was sold, there were 35,000 to 40,000 names on the mailing and waiting lists combined according to winemaker Bob Cabral, who took over for Williams. Williams kept meticulous technical notes regarding vineyard grape samples, weather, picking dates, fermentation temperatures, vinification decisions, aging and so forth. Extensive tasting notes were also preserved. 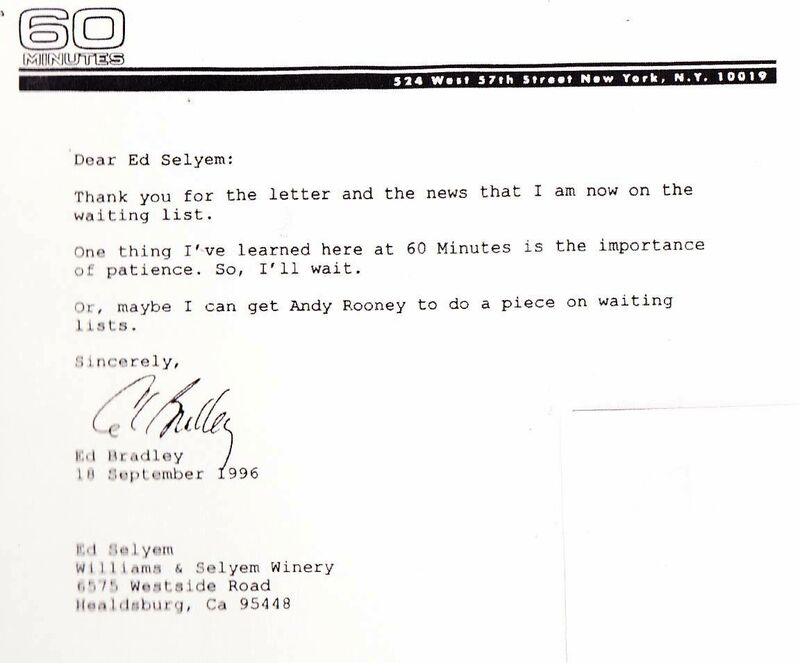 These notes would prove invaluable to Bob Cabral when he took over the winemaking at Williams Selyem in 1998, since initially he had no familiarity with the vineyard sources at Williams Selyem. 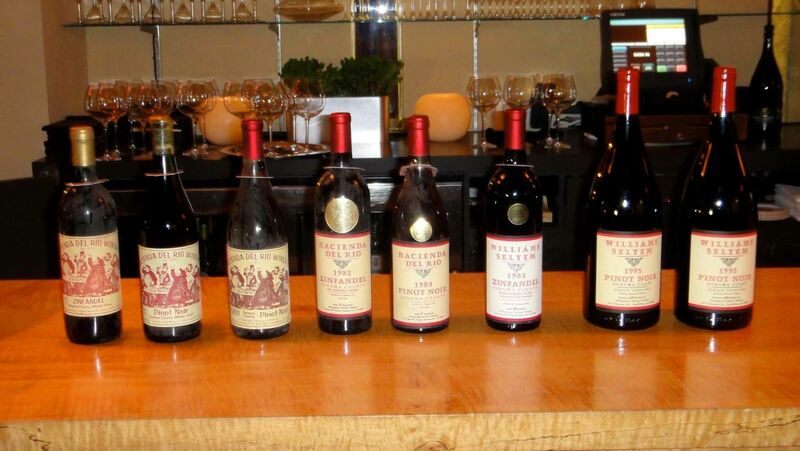 Williams had a number of favorite wines over the years including the 1983 Martinelli Zinfandel, the 1986 and 1995 Rochioli Vineyard Pinot Noirs, and the 1991 and 1995 Summa Vineyard Pinot Noirs. The 1991 Summa Vineyard Pinot Noir was the first California Pinot Noir to sell for $100. The price reflected the tiny yields of .5 ton per acre of fruit which produced two new barrels of wine. A total of 1 ton of usable grapes was harvested from 4 acres which worked out to a price of $5,000 per ton when you consider the farming costs for three years, two of which - 1989 and 1990 - no usable grapes were obtained. Williams figured that if people wouldn’t buy it, he and Ed would take it all home and drink it. As Williams said, “C-note or c-none.” The wine sold out in three days. 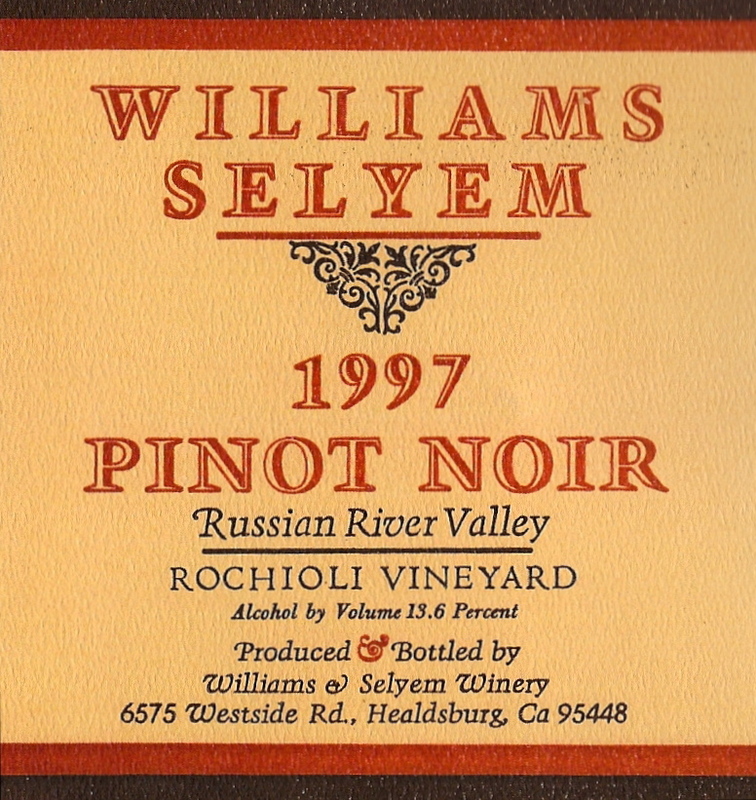 The last vintage of Williams Selyem Rochioli Vineyard Pinot Noir in 1997 also sold for $125 at Williams request. When asked to recall a few favorite story from his years at Williams Selyem, Williams offered the following. For a number of years, Burt and Ed would meet annually with Jack Daniels and Win Wilson, importers of Domaine de la Romanee-Conti, and sample each other’s wines over lunch. Williams recalls one bacchanal in 1992 or 1993 when the group, which included winemaker Chris Whitcraft, started and ended with Champagne and in between, the small group drank 22 bottles of DRC and Williams Selyem, the “best Pinot Noirs in the world.” Nothing sweeter than a Pinot Noir hangover! 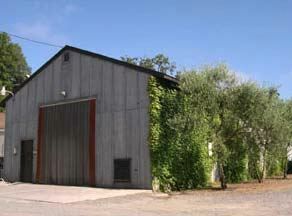 In a 1987 newspaper article, Ed Selyem told the Press Democrat, “Our goal is to purchase some agriculturally zoned land in the lower Russian River Valley so that we can continue to produce this quality of Sonoma County wine on our own property.” This goal was never realized, and once the pair had a suitable production facility at Allen Ranch, they were content. They soon had no desire to own an estate vineyard. At first they had their other jobs and were too busy. After they quit their jobs and worked full-time at the winery, they had to concentrate on making and selling wine and would have been spread too thin by also attempting to manage a vineyard. Besides, they had talented growers they could rely on and mature vines to source from. After the winery was sold, Williams bought a 40-acre property in 1998 in the Anderson Valley and planted 13 acres of Pinot Noir. 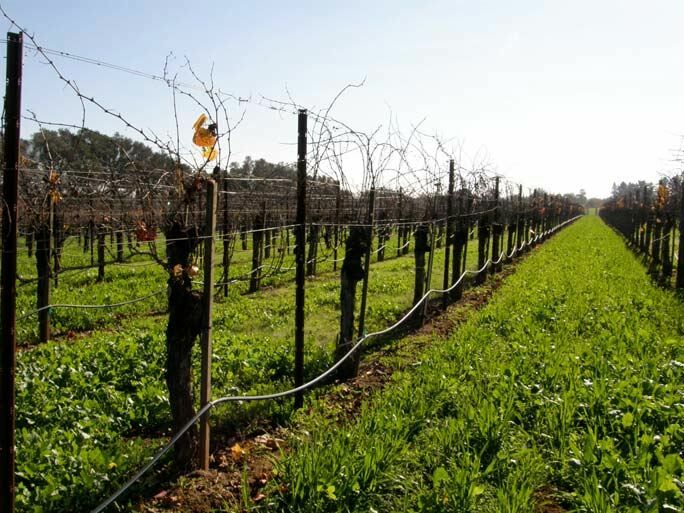 Williams had looked at the Freestone area of the true Sonoma Coast and other cool climate winegrowing regions as well, but settled on the Anderson Valley, in part because the land was more affordable. Under the direction of vineyard manager Steve Williams (no relation), the land was cleared and planted to cuttings from the Rochioli Vineyard, “DRC” suitcase selections from adjacent vineyards, clone 23 (Mariafeld - a clone Burt’s son favored), and Dijon clones 115, 777 and 828. The vineyard was named Morning Dew Ranch. The soils are Franciscan type, clay underlain with sandstone. The vines were irrigated to establish them initially, and some irrigation is required in certain vintages to ripen the fruit. 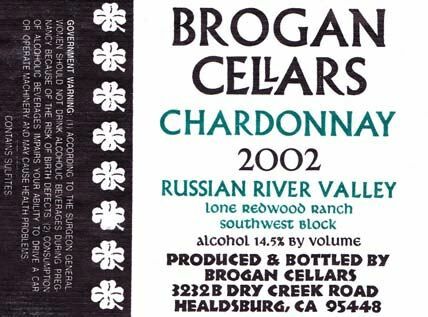 The fruit from Morning Dew Ranch has been released as a vineyard designated Pinot Noir by Brogan Cellars (owned by Burt’s daughter, Margi Williams-Wierenga), Woodenhead, and Whitcraft. The agreements are, of course, on a handshake basis. 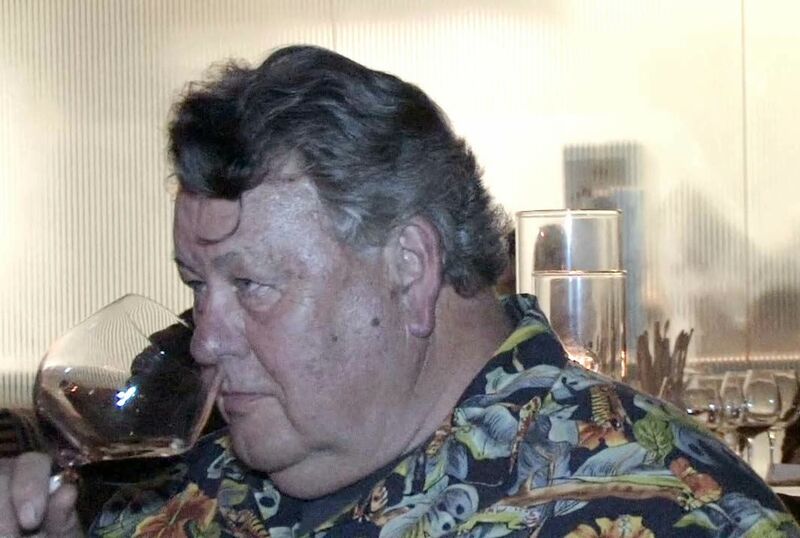 Williams crafted small amounts of Pinot Noir from his vineyard in 2008 and 2009, and with his ten year non compete clause reaching expiration in 2008, he released the two vintages commercially in 2010 and 2011 under the Morning Dew Ranch label. He has no plans to produce any wine after the 2009 vintage, choosing instead to enjoy his retirement. Although the sale of Williams Selyem in 1998 cast a pall over many devoted customers, fortuitously a number of aspiring vintners who spent time at the winery during the 17-year run of Williams Selyem have preserved the Williams’ winemaking legacy in the many off shoots that now exist. The wineries include WesMar (Denise Selyem and Kirk Hubbard), Davis Family Vineyards (Guy Davis), Papapietro Perry (Ben Papapietro), Woodenhead Vintners (Nikolai Stez), Cobb Wines (Ross Cobb), and Mac McDonald (Vision Cellars). In addition, Williams probably inspired more winemakers to make Pinot Noir than any other vintner in California. The list of admirers includes a who’s who of New World Pinot Noir producers: Bob Cabral (current winemaker at Williams Selyem), Michael Browne (Kosta Browne), Steve Doerner (Cristom), Ted Lemon (Littorai), George Levkoff (george wines), Tim Olson (Olson Ogden), Manfred Krankl (Sine Qua Non), Jeff Fink (Tantara), Craig Brewer (Brewer-Clifton), Tom Dehlinger (Dehlinger), Chris Whitcraft (Whitcraft), Tom Rochioli (J. Rochioli Vineyards & Winery), Michael Sullivan (Benovia), and Thomas Rivers Brown (Rivers-Marie). There are still hundreds of other winemakers who revere him, although they may have never met him. Williams also inspired his progeny to become winemakers. Daughter Margi, who was a teenager when her father began making wine seriously in the 1970s at home, worked as a volunteer at her father’s winery in Fulton before taking a paid position as an assistant to Burt and Ed in 1990 at the Allen Ranch facility. 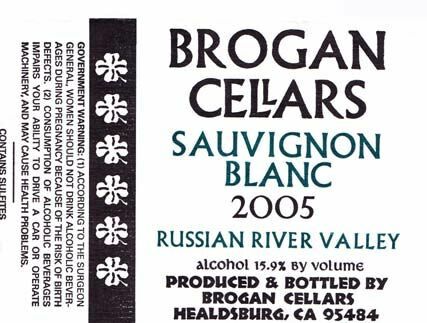 In 1998, when Williams Selyem was sold, she decided to follow in her father’s footsteps and started her own bootstrap winery, Brogan Cellars. In 2002, she won the Red Wine Sweepstakes Award at the Sonoma County Harvest Fair. Burt and Margi are shown below at Burt’s Tribute Dinner. 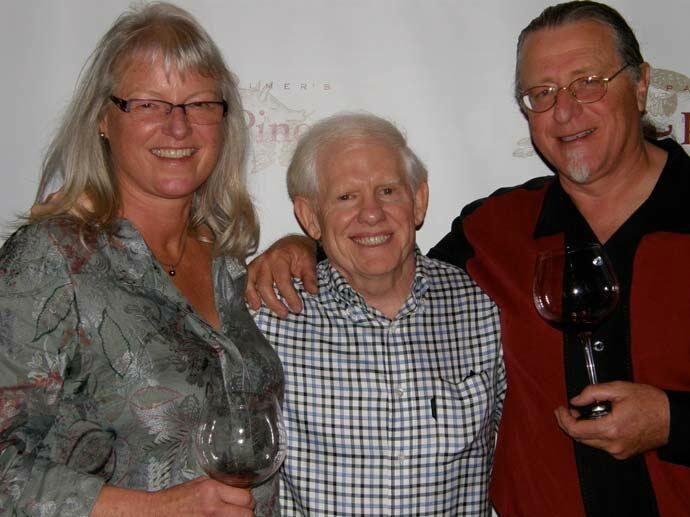 Williams’ son, Fred B. Williams, Jr., also pursued winemaking and was the winemaker for Seven Lions Winery, in Sebastopol in 1999, specializing in Pinot Noir, Zinfandel and Chardonnay. 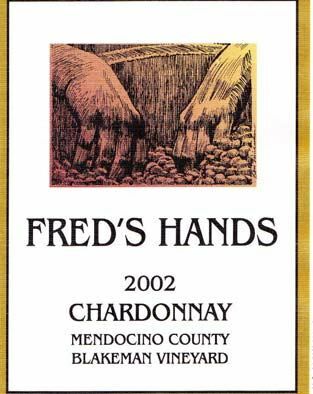 He tragically passed away at the age of 38 from burns suffered in a truck explosion in 2003, but was memorialized with new wine labels, Fred’s Hands and Seventh Domaine. The label was created by his former business partner, Charles A. Genuardi, and Fred’s sister, Margi Williams-Wierenga. The wines were made from grapes crushed by Fred Williams in the 2002 and 2003 vintage before his accidental death. Williams was such an iconic Pinot Noir winemaker, it would seem fitting to have a name for him. After all, Josh Jensen of Calera Wine Company is “Mr. Pinot,” Merry Edwards of Merry Edwards Wines is the “Queen of Pinot,” and Larry McKenna of Martinborough Vineyards and Escarpment in New Zealand is the “Prince of Pinot.” For Williams, I thought of “Pontiff of Pinot,” but he is such a humble, regular guy, the nickname seems like too much aggrandizement. I think just plain “Burt” is good enough, because when you mention Pinot Noir and Burt in the same breath, everyone knows who you are talking about. Burt Williams’ career will show that winemaking, like any craft, is a God-given talent, enhanced by education and experience, but a craft for which some people are more blessed. The following are among the important legacies of Burt Williams, his partner Ed Selyem, and Williams Selyem winery. 1. One of California’s ultimate cult wineries and the first for Pinot Noir. 2. California’s first $100 Pinot Noir. 3. First California Pinot Noir to be exported to Burgundy and offered on restaurant lists in Burgundy. 4. First winery to bring consumer’s attention to a sense of place reflected by specific vineyards such as Rochioli, Allen, Olivet Lane, and Summa. 5. First vineyard designates from Allen Vineyard, Summa Vineyard, Precious Mountain Vineyard, Cohn Vineyard and Olivet Lane Vineyard. 6. Emphasized that vineyard designated Pinot Noir should only be offered when the vineyard warrants it. 7. Turned the consumer’s attention to growers and their vital importance in fine wine production. Also set the stage for vintners and growers to work together. 8. Fostered the winemaking approach now widely followed by Pinot Noir producers including hand sorting of grapes, punch downs, and no pumping in the winery. 10. Developed a proprietary yeast that is now in wide use in Pinot Noir winemaking. 11. Brought worldwide recognition to the Russian River Valley and its wines, particularly Pinot Noir. 12. 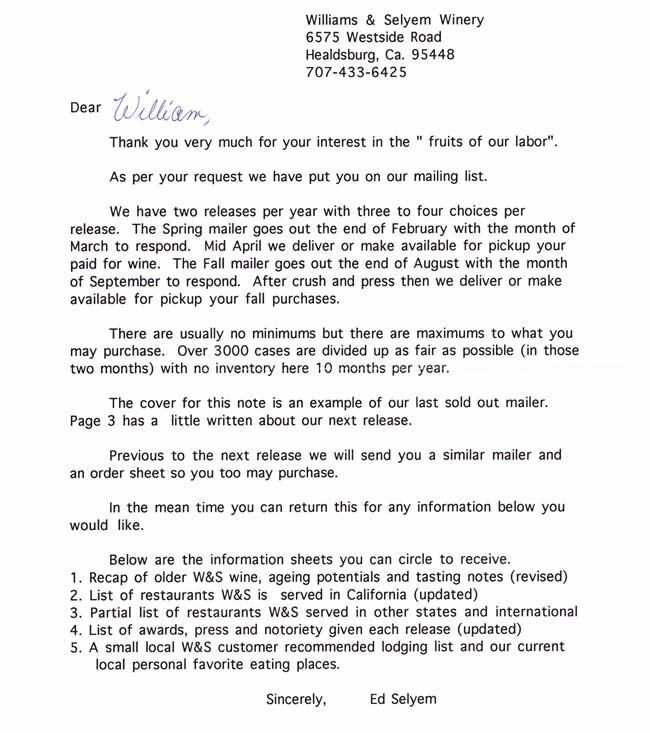 Originated the mailing list (and waiting list) model for selling wine directly to consumers. 13. Among the first California Pinot Noir producers to offer wines in magnum format for most bottlings. 14. Demonstrated that intuition through experience is invaluable in crafting Pinot Noir. 15. Most importantly, Williams Selyem showed that great wine, and in particular Pinot Noir, can be produced without artifice. Technological methods such as saignée, alcohol adjustment, addition of Rubired extract, or other products to change color, flavor, acid, tannin and mouth feel, are simply not required nor desired. Technology and expensive equipment can be useful winemaking adjuncts but are not requirements for fine wine production. 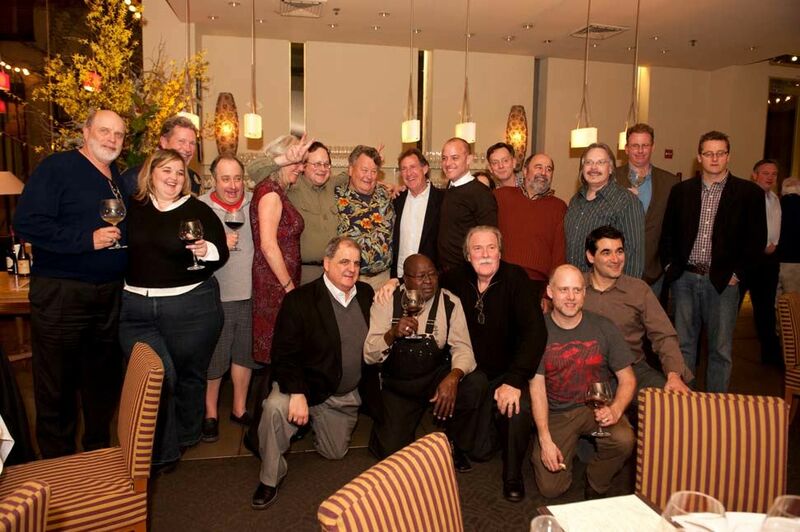 A memorable dinner was held at the Dry Creek Kitchen Restaurant in Healdsburg, California to honor Burt Williams as an iconic figure who was among the first to master the art of crafting extraordinary and long-lived California Pinot Noir. The gathering of invited guests included winemakers who were inspired by Burt Williams, growers who worked side-by-side with him over the years, many close friends and family members. The dinner featured six courses: one course served with 2008 Woodenhead ‘Naturale’ Sparkling Russian River Valley French Colombard, four courses accompanied by historic vintages of William Selyem wines from the personal library of Burt Williams and an artisanal cheese course, accompanied by wines shared by the winemakers in attendance. Each of the winemakers brought a special bottle as a gift to Burt Williams. For example, Jeff Fink’s first barrel of Pinot Noir in 1992 was vinified with the yeast that Burt developed from the Martinelli Jackass Hill Vineyard. Later, Jeff would craft one barrel of Burt Central Coast Pinot Noir composed of equal portions of all twelve of Tantara’s single vineyard Pinot Noirs. A bottle was affectionately presented to Williams at the dinner. At the reception before the dinner, wines were served that were crafted by Margi Williams-Wierenga including 2002 Fred’s Hands Blakeman Vineyard Mendocino County Chardonnay, 2005 Brogan Cellars Russian River Valley Sauvignon Blanc and 2002 Brogan Cellars Lone Redwood Ranch Southwest Block Russian River Valley Chardonnay. With each wine served at the dinner, Burt Williams came to the podium and read his production notes on the wine the year it was released. Those notes are included below along my brief impressions of the wines. All those in attendance were astonished at the freshness of the wines after 15-18 years. The magnum format and the provenance (they have been stored in Burt’s cellar since release) contributed to their impressive showing. 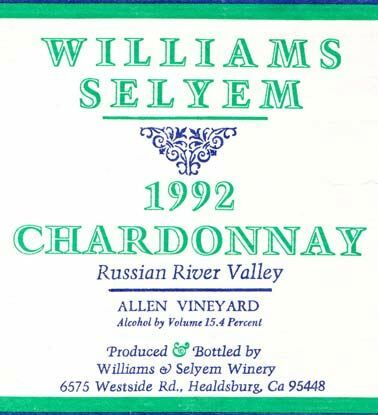 Since 1990, Williams Selyem produced 150 to 200 cases annually of Chardonnay from Allen Vineyard. The wines were barrel fermented and aged sur lie for 11 months. Burt: 4.25 tons were picked on 9/14/91. Aged in 50% new and 50% used French oak barrels. Fermentation began with indigenous yeast, inoculation with Williams Selyem yeast at the half way point. 7 month ferment, with lees stirring once a week. Unfined and unfiltered. 15.4% alc., pH 3.20, $30 (750 ml). Rusty: Has held up remarkably well. Mineral, citrus and nutty aromas and flavors which are vibrant, with well-honed acidity. Burt: 24 tons picked on 9/8/92. 25% whole cluster. Inoculated with Williams Selyem yeast after 3 days. Aged 11 months in 60% new and 40% 1-year-old Francois Fréres French oak barrels. 13.9% alc., pH 3.46, $56. Rusty: A beautiful aged patina, retaining good depth of color and well-preserved. Aromas of spice, grilled mushrooms and forest floor. Moderately intense plum and dark berry flavors. Silky mouthfeel with a long finish. Burt: 3.39 tons picked on 9/21/95. 35% whole cluster. Williams Selyem yeast added on day 4. 11-day ferment. Aged 16 months in 100% new Francois Fréres Troncais French oak barrels. Black cherry, cola, licorice. Long, black fruited finish. One of the finest wines I have made. 13.7% alc., pH 3.37, $65 (750 ml). Rusty: Wow! Still has an impressive load of black cherry fruit on board with hints of leather, mushroom, vanilla and cola. Amazingly intense in flavor with a creamy, opulent texture and a finish that hangs on with a vengeance. Burt: 19 tons picked from 5 blocks on 9/28/95 and 10/6/95. 23% whole cluster. Ferment lasted 11 days. Aged 16 months in 75% new and 25% 1-year-old Francois Fréres Troncais French oak barrels. 13.5% alc., pH 3.66, $40 (750 ml). Rusty: The most aromatic Pinot Noir in the lineup. Great ruby color and mixed dark berry fruit intensity with melded tannins but still possessing a firm structural spine. Intensely fruity with plenty of spice on the finish. The wine has aged beautifully, a fitting compliment to the Filet Mignon served with it. 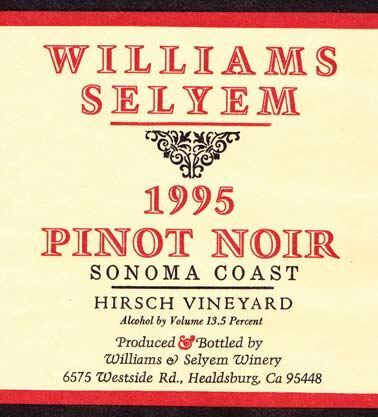 A note regarding older vintages of Williams Selyem Pinot Noir. Storage is everything and one must be cautious when buying Williams Selyem wines on the secondary market if the provenance is not well known. I have had variable drinking experiences with single bottles of Williams Selyem over the past couple of years. A 1993 Sonoma Coast Pinot Noir was stunning a few months ago. A 1992 Rochioli Vineyard Pinot Noir two years ago was magnificent upon opening, but faded quickly over time. For older vintages of Burt Williams-crafted Pinot Noir, your safest bet is magnum format. Prices have escalated for the few magnums in the marketplace, but the bottles, if stored properly, are well worth the tab.